Coffee in Vietnam is a very different experience. Our first real taste was on Day 1 of the cycling tour when we stopped at a roadside cafe. Thick black liquid was poured from a large thermos and then sweetend condensed milk added from a can. The typical coffee from a vendor like this has a hint of a vanilla flavour, not unpleasant, but it is mainly just strong and sweet. Locals tend to drink this over ice, which is appealing considering the climate, but we are cautious of what sort of water was used in the making of the ice. From one or two of our hotels we have also experienced the ‘personal percolator’ as I will dub it. A stainless steel coffee filter, shapped like a top hat, that sits directly over your cup. This results in a very strong brew that will definitely keep you awake for a while. 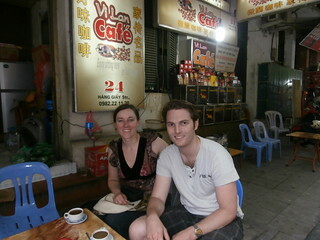 This morning after wandering around the streets of Hanoi for a few hours these two travellers needed a coffee when we wandered into the coffee district. We enjoyed probably the nicest coffee of our trip at this streetside coffee shop which served a varity of coffees, including the Weasel blend. A little extra flavour added care of the digestive tract of a weasel – beyond our limits, so no, we did not try. If coffee’s not your thing you can always sit down on a child size plastic chair at almost any street corner and enjoy some green tea for about 5,000 Dong (25 cents). I’ve never been a big fan of green tea but can now see its because we do it all wrong in Australia. A mug is far too much but a large shot glass is about perfect. Oh c’mon Dad you love it there! or is Campos your new favourite?